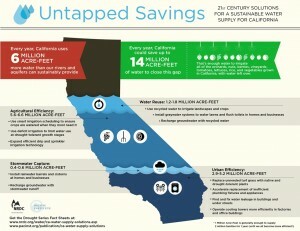 California could be saving up to 14 million acre-feet of untapped water – providing more than the amount of water used in all of California’s cities in one year – with an aggressive statewide effort to use water-saving practices, reuse water, and capture lost stormwater, according to a new analysis released by the Pacific Institute and Natural Resources Defense Council. The Untapped Potential of California’s Water Supply is a first-of-its-kind statewide analysis examining the significant potential contributions achievable from a combination of improved efficiency in agricultural and urban water use, water reuse and recycling, and increased capturing of local rainwater. Learn more. Check out the accompanying infographic. Read the Sacramento Bee Op-ed from the Pacific Institute and NRDC. In May, we covered what we know so far about this year’s progress of some of California’s major crops. Recent polls indicate that a majority of Californians believe the drought is a major problem, although most do not want to pay money to address it. Read the latest drought update. 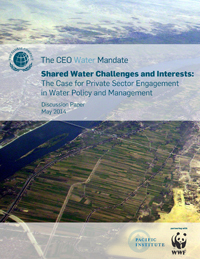 The CEO Water Mandate, for which the Pacific Institute serves as Secretariat, and WWF just released the jointly-developed discussion paper “Shared Water Challenges and Interests: The Case for Private Sector Engagement in Water Policy and Management.” This paper addresses and refutes recent criticisms of corporate water stewardship and collective action approaches and makes a case for the role of business in advancing sustainable water management. Learn more. The CEO Water Mandate co-hosted a workshop with Deloitte entitled “Working Together to Address Acute Water Challenges: Water-Related Collective Action in California and the Colorado River Basin.” The multi-stakeholder event was attended by a range of interests from the region, including representatives from municipal water districts, private industry, and local and national NGOs. The action-oriented event offered participants the opportunity to explore cross-sectoral collaboration opportunities that address shared water challenges. Read conclusions from the event. Read a summary blog post about the event by Environmental Defense Fund’s Emily Reyna. 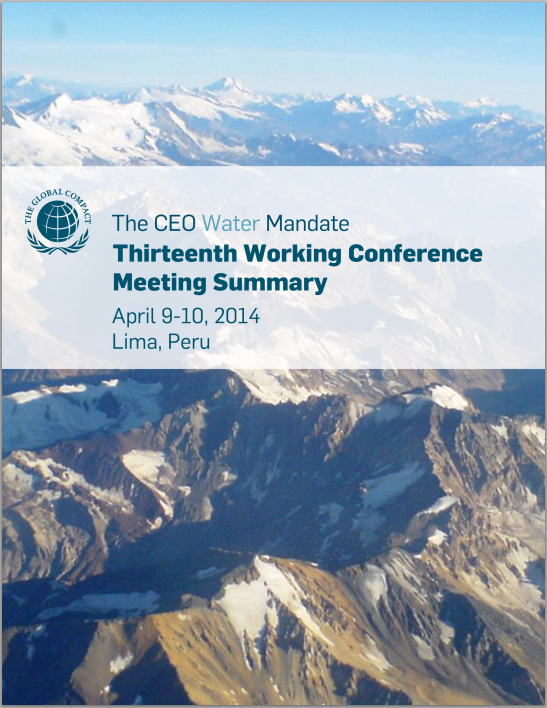 On April 8-10, the CEO Water Mandate convened its thirteenth multi-stakeholder working conference in Lima, Peru. The Mandate Secretariat has released the meeting summary and speaker presentations from this event. Learn more. Download the meeting summary (PDF). $7.99 Water E-books Promotion – This Week Only! Through this Sunday, June 15, Island Press is offering every e-book in their catalog for $7.99, including Peter Gleick’s Bottled & Sold and several volumes of The World’s Water, as well as other water books. Visit islandpress.org/sale to find these ebooks and more, with links to buy at online retailers. 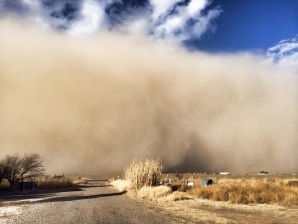 Drought is deepening in the southern Great Plains, a beleaguered region whose four-year dry cycle has been like a roller coaster ride through a high-velocity hair dryer. Soils are baked and blowing, farmers are nervous, and groundwater tables continue to fall. Circle of Blue continues its Choke Point: Index reporting on water challenges facing some of the United States’ most productive regions, including the Ogallala Aquifer, California’s Central Valley, and the Great Lakes. Read Ogallala Water Use Climbs as Drought Intensifies in the Southern Plains. Pacific Institute staff presented talks and workshops this month including speaking with Stanford students, giving the opening remarks at the California Urban Water Conservation Council’s Landscape Symposium, and participating on panels co-hosted by WWF and Coca-Cola.Read the full list and more details here. – On June 17, The U.S. Chamber of Commerce Foundation, VOX Global, Pacific Institute, and WASH Advocates are hosting a free webinar on VOX Global and Pacific Institute’s Managing Water Risk report. Gain insights on corporate perceptions of water risk in the US, and learn about current water management practices for addressing water risk within operations and supply chains. Register here. – On July 1, Michael Cohen will present “Protecting Community Health: What If We Do Nothing? – The Threat to Imperial and Coachella Valley” at the Clinton Health Matters Initiative’s The Salton Sea: Restoration for a Healthy Future forum. The forum starts at 1:00 pm at the W.R. Condit Auditorium, 1285 Broadway Ave, El Centro, CA 92243 and is open to the public. * KCET Radio: Looks at our new drought reports and a sustainable water future. * Bloomberg Business: Covers new article from Peter Gleick analyzing how the Syrian Conflict has been exacerbated by effects of poor water management. * Sacramento Bee: Groundwater depletion and the sinking San Joaquin Valley. * Associated Press: Peter Gleick discusses California’s flawed water system and water rights. * San Jose Mercury News: Heather Cooley discusses the costs of desalination and water supply options in California.